Strider is an odd franchise. The original game was released in arcades in 1989, and (poorly) ported to a number of home consoles that same year, before it saw a proper release on the SEGA Genesis in 1990. A sequel, Strider II, was produced in Europe by U.S. Gold and Tiertex without Capcom’s involvement and released as Journey From Darkness: Strider Returns in North America, though it never appeared in Japan. Years later, Capcom would develop their own sequel, which released as Strider 2 in arcades and on the PlayStation in 2000. After that, though, the series went dormant. The series’ iconic protagonist, Strider Hiryu, would go on to appear a number of other Capcom titles, most recently Ultimate Marvel vs. Capcom 3, where he made his first appearance as a 3D character and was voiced in English for the first time. As Super Smash Bros. taught us, crossover fighters are great tools for brand resurrection, and Capcom isn’t one to miss a beat when there’s money to be made. "Thankfully, the game doesn’t take itself too seriously. References to Star Wars abound, and the game is as likely to skewer itself as it is some of the genre’s more over the top elements." With that in mind, a new Strider game seemed all but inevitable. This time, development fell to Capcom’s Osaka studio and Double Helix Games. Capcom’s previous efforts to outsource its properties to Western developers have produced mixed results: Lost Planet 3 was an inoffensive, if forgettable, game and the less said about the disastrous Dark Void, the better. Strider fans need not be concerned, however. 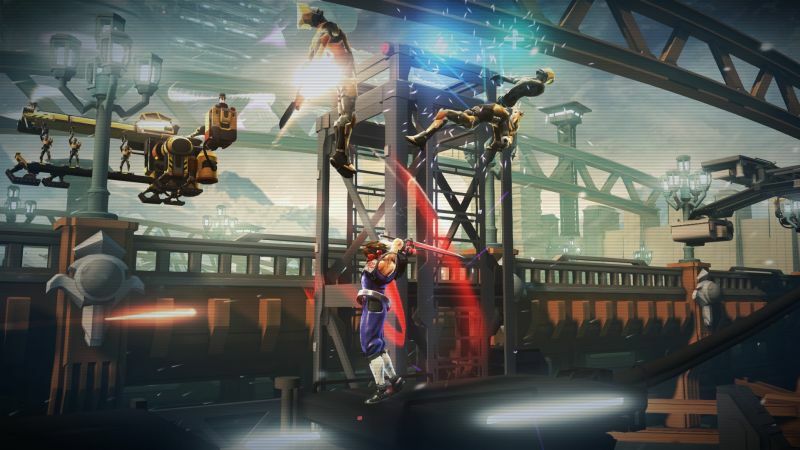 As they did with the latest incarnation of Killer Instinct, Double Helix steps up admirably, and the result is a great romp that doubles as a fantastic reimagining of the original Strider titles. Yes, Strider is more of a reimagining than it is a reboot and many of the same story beats carry over from the 1989 title. That’s not to say that the game has much of a story, though. 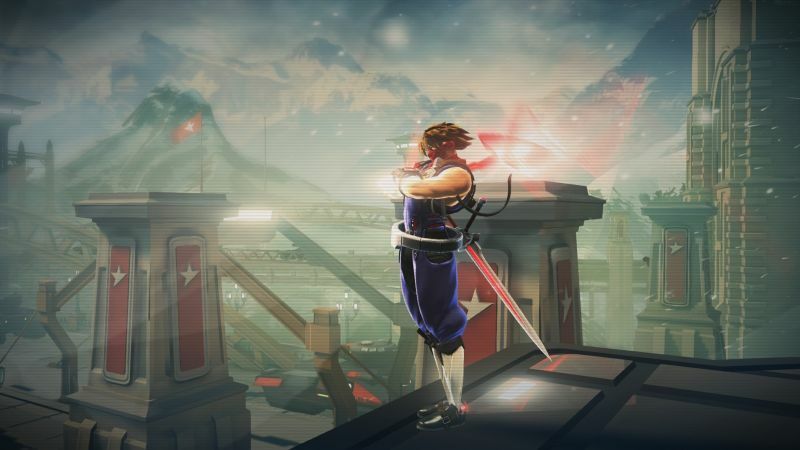 At the beginning of the game, Hiryu is dropped – via hang glider, no less – into Kazakh City and tasked with killing its leader, Grandmaster Meio. If you’re looking for narrative depth, you won’t find it here. This is a game filled with cheesy villains and bad Russian accents. Thankfully, the game doesn’t take itself too seriously. References to Star Wars abound, and the game is as likely to skewer itself as it is some of the genre’s more over the top elements. At one point, one of the bosses tells Strider that he can’t possibly win because he has a gun, and Strider only has a knife. Later on, it introduces a boss as “The True Form” in large, bold letters. Strider is simply that kind of game, and it doesn’t care that you know it. "These abilities are a great aid in combat, but they’ll help you get around in the game world, too. In a rather bold move, Double Helix opted to jettison the series linear, side-scrolling nature in favor of a Metroidvania approach." Frankly, however, the game’s story doesn’t really matter; it’s just there to provide a reason for Strider to do the things he does. The real draw here is the action itself, and thanks to the game’s truncated opening, that starts the moment Strider hits the ground. The game is fast and fluid and you’ll be cutting through victims like a ninja wielding a plasma sword almost immediately. 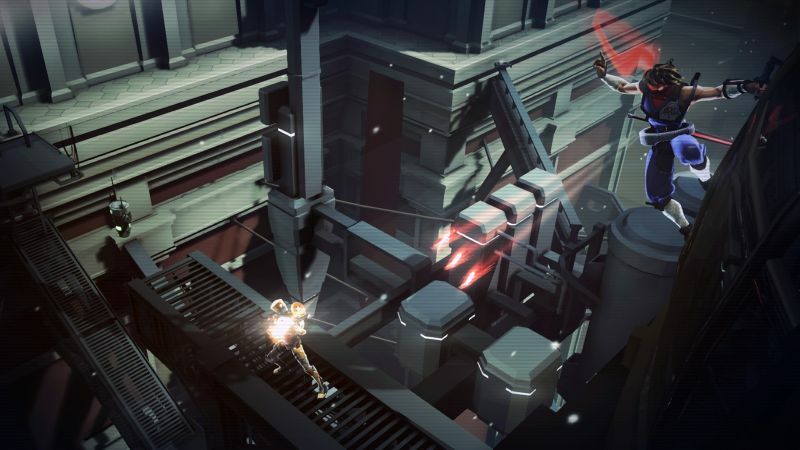 That’s not to say that Strider is an easy game – it’s not – but you’ve always got the tools you need for a given situation and the controls are extremely precise. If you die, it’s on you. Still, things do start fairly simply. Hiryu begins the game with a basic attack, a heavy attack that can knock enemies into the air, and a jump. You’ll acquire a number of upgrades over the course of your journey ranging from kunai, which can be thrown at enemies, to special abilities known as Options, which can be activated at the cost of some of Hiryu’s energy for big damage, and in one case, a defensive boost. These abilities are a great aid in combat, but they’ll help you get around in the game world, too. In a rather bold move, Double Helix opted to jettison the series linear, side-scrolling nature in favor of a Metroidvania approach. Naturally, this means that you’ll be doing some backtracking and certain areas will be closed off until you acquire the items necessary to gain access to them. 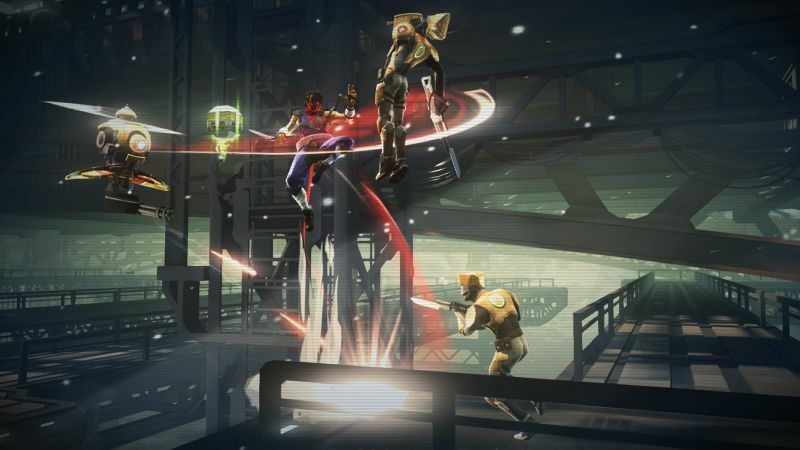 Genre staples such as the double jump, dash attack, and a slide attack make an appearance, but with the added wrinkle that Strider is able to climb walls and cross ceilings naturally, which allows Double Helix to mix up the environments, and the manners in which you’ll traverse them, significantly. "Strider’s combat is an absolute joy when you finally get everything figured out, and everything really comes to a head in the game’s mini-boss and boss fights. These are often the most extreme tests of your skill, and the game doesn’t pull punches with any of them. " The real star of the show, however, is the Cypher, Hiryu’s plasma sword. Over the course of the game, you’ll gain access to different types of plasma, each of which allows you to unlock doors and activate switches within the environment and adds an additional effect to Strider’s attacks. The standard red plasma, for example, allows you to deflect (or reflect, if you time it properly) enemy fire, the orange plasma lights things on fire, and the blue plasma allows you to freeze your foes. Certain enemies can only be defeated by using the plasma that matches their color, which adds a quite a bit of depth to the combat, and you’ll often find yourself frantically switching between plasma types during combat as you try to find the best answer for a situation. Strider’s combat is an absolute joy when you finally get everything figured out, and everything really comes to a head in the game’s mini-boss and boss fights. These are often the most extreme tests of your skill, and the game doesn’t pull punches with any of them. You might struggle against a mini-boss only to enter the next room and watch in horror as the game throws three of them at you as regular enemies, but the real treat are the actual bosses themselves. There are quite a few of them and each is very well designed and a lot of fun, requiring you to master new patterns and mechanics. Unfortunately, the game forces you to fight many of the bosses several times. This is mitigated by the fact that each fight is legitimately different than the one that came before it, sometimes drastically so, and that the game will rarely ever ask you to fight a character more than twice. Still, it can be annoying to fight the same characters over and over again, no matter how good the fights are. "The environments aren’t problem free, however. Some areas are overly frustrating due to a combination of platforming challenges and enemy placement, and I did get stuck in the environment twice, forcing me to reload a previous checkpoint both times." Boss fights aside, Strider does its best to mix things up. Kazakh City is an incredibly varied place, and over the course of the game, you’ll travel the city’s rooftops, descend into the sewers, infiltrate a military base, and explore secret laboratory, among other areas. The game looks fantastic, and all of these areas are modeled in bright colors and feature unique challenges that must be overcome if you are to progress. The environments aren’t problem free, however. Some areas are overly frustrating due to a combination of platforming challenges and enemy placement, and I did get stuck in the environment twice, forcing me to reload a previous checkpoint both times. In addition, Strider sometimes grows a little too fond of its industrial corridors for its own good, but by and large, the environments are a lot of fun to explore, and you never know what you’ll see next. The enemies that inhabit these environments are just as varied and colorful, and the world feels cohesive and real in a way few games manage. The most impressive visual trick is Strider himself, from the way he moves to the way his scarf changes color depending on which plasma type you have equipped to your Cypher. The game does have some odd visual inconsistencies – for example, characters’ mouths don’t move when they speak – but overall the visuals are very impressive, and Double Helix often uses them to convey elements of the game’s design in clever ways. "Ultimately, “a different take” is pretty good way to describe Strider, especially given the series’ odd history. Double Helix has managed to straddle the line between a remake and a full-fledged reboot, and create something that is unique, while still feeling like a Strider title, and playing to the series’ strengths." Sound design is a little more hit and miss. Some sounds, such as voices and Strider’s Cypher, occasionally seem a bit muffled outside of cutscenes, while everything else is often fairly loud and distinct. It’s a minor complaint, and everything sounds pretty good when the sound mixing comes together properly, which is most of the time. Like most Metroidvanias, Strider isn’t necessarily a long game. I finished it on normal in a little over six hours. That number is probably closer to eight hours when you include my deaths, but I only managed to complete fifty-three percent of the game. If you take the time to find all of the hidden upgrades and collectibles, I would imagine it takes much longer, and fans of speed runs should rest assured that the game can be completed in significantly less time, if you know how. Once you’re done with the main adventure, you can tackle the game’s challenge modes: survival and beacon run. Survival mode is about combat, and the game grants you a preset load out of abilities before turning you loose on wave after wave on enemies to see how long you can survive. Beacon run, on the other hand, is all about speed, tasking you with passing through a number of beacons as quickly as you can while avoiding enemies and environmental traps.Each challenge is scored, and there are leaderboards to challenge for the skilled and dedicated. 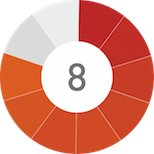 The main game will remain the core, and likely only, draw for most people, but the challenges provide a nice change of pace for those who want a different take on the game. Ultimately, “a different take” is pretty good way to describe Strider, especially given the series’ odd history. Double Helix has managed to straddle the line between a remake and a full-fledged reboot, and create something that is unique, while still feeling like a Strider title, and playing to the series’ strengths. It’s the kind of game that will appeal to old fans of the franchise and create new ones, and something tells me that this isn’t the last we’ll be seeing of Hiryu or Kazakh. Perhaps, then, the best word for Strider is “revival.” It was a tall order, but that’s what makes it successes so impressive. Mission accomplished, indeed. Excellent combat. Strider is a lot of fun to control. Great take on the Metroidvania formula. The story knows how ridiculous it is and doesn’t take itself seriously. Fantastic boss fights. A steady stream of new upgrades, enemies, and environments keeps you on your toes. The characters and environments look really good. Lots of areas to explore and stuff to collect. Having to fight bosses multiple times can be annoying. Occasional visual and audio inconsistencies pull you out of the world. Getting stuck in the environment and having to restart from your last checkpoint is a downer. 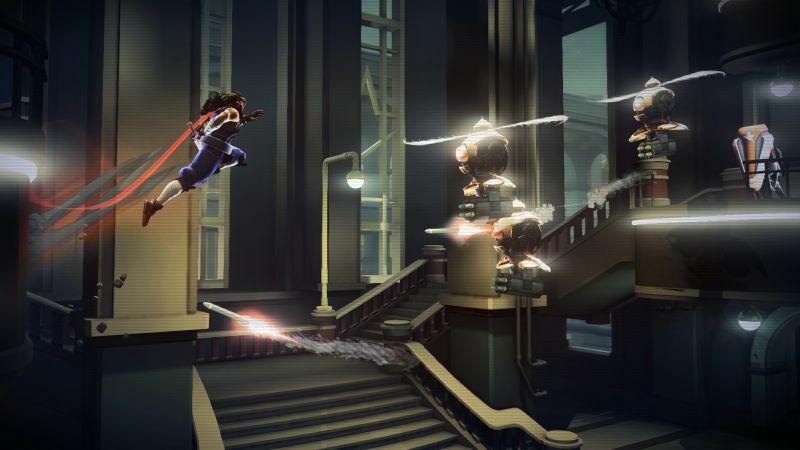 Strider is an excellent revival of a classic franchise that will appeal to old fans and create new ones. If you like excellent combat and the Metroidvania style of design, you should definitely check it out.